We’ve had snowstorm after snowstorm up here in New England, which has cancelled a number of volunteer days; luckily, we did manage to sneak in a Saturday and Tuesday along with some home work. Burr delivered 27 sail hoops that will be nickel-plated along with a number of the fittings and castings we’ve recently received. He also delivered the capstan winch located on the boom near the gooseneck. 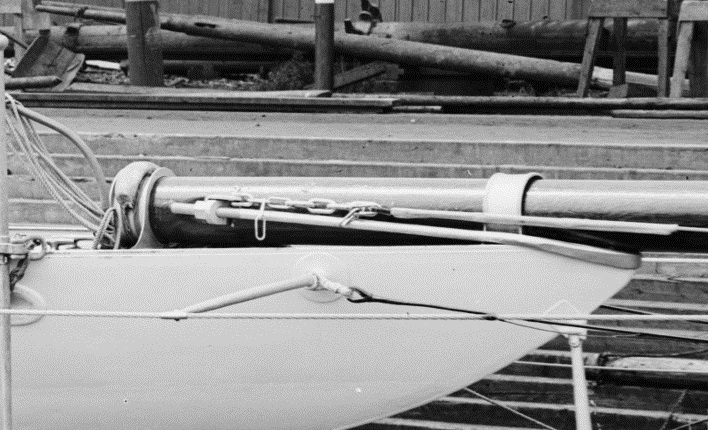 Interestingly, it is the same size as the deck capstans, but with a slightly different base to fit the circumference of the boom. 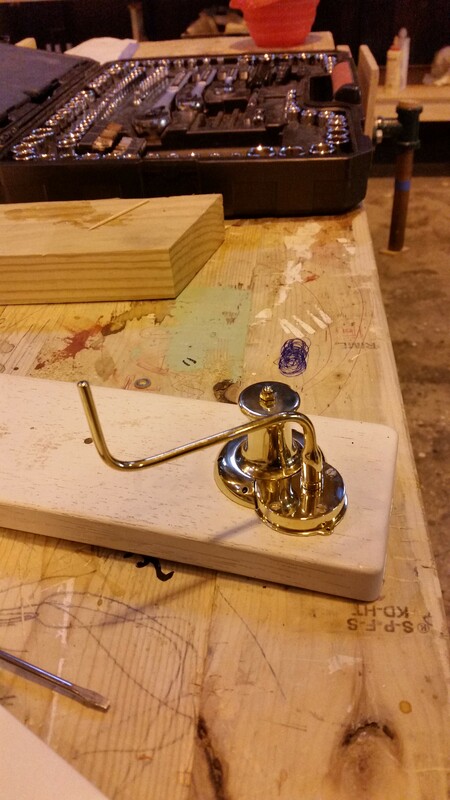 We then tasked Burr to make a scale bowsprit retaining bar; it has to be made just like is was by the HM Co blacksmiths. A few hours later, Burr returned with a model to check fit the piece. Now he’s off making the whole thing, which we’re excited to see! 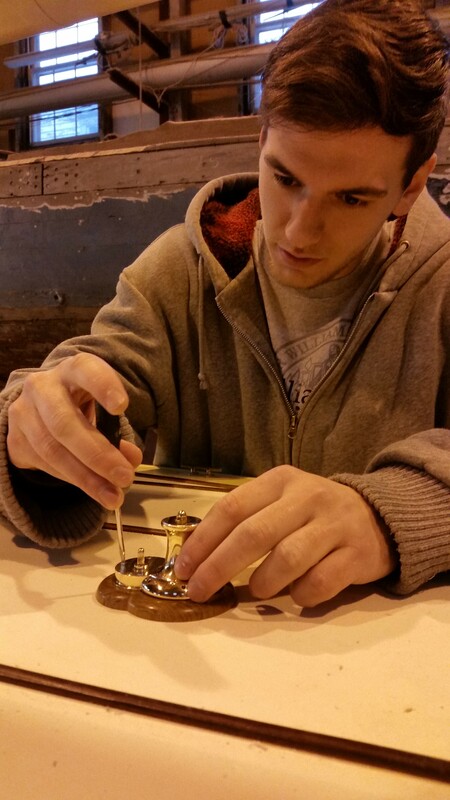 Zach, our Roger Williams University intern, has helped out in preparing Mike’s bronze castings for plating. 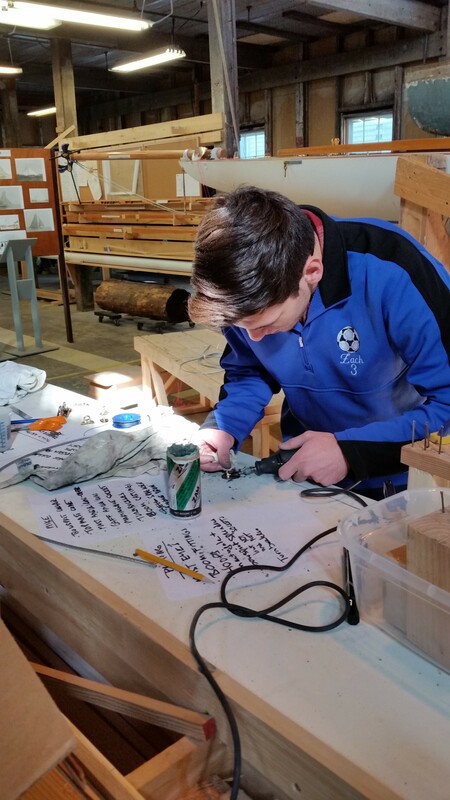 Zach’s also working on some exhibits for our opening day. Lastly, the boom and gaff have received final painting and are awaiting their fittings. 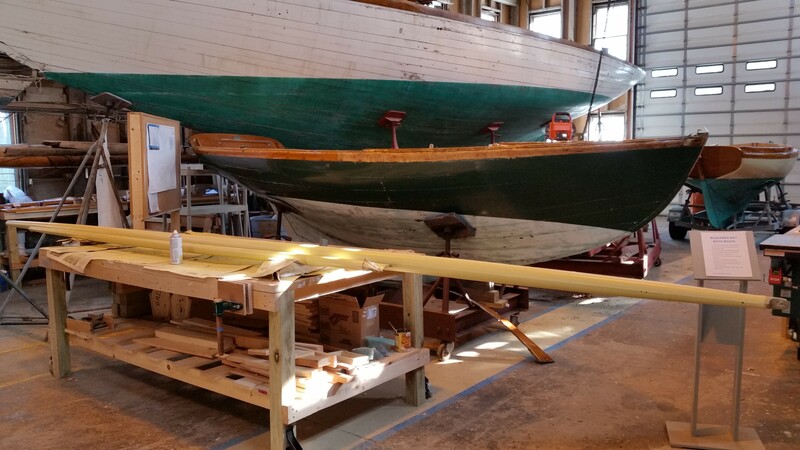 This entry was posted in Project Manager's Welcome and tagged boom, bowsprit, bronze, capstan, capstans, casting, fittings, Herreshoff, Herreshoff Marine Museum, hoops, plating, RELIANCE, Reliance Model, RELIANCE Project, sail, Sailing on February 11, 2015 by Herreshoff Marine Museum/America's Cup Hall of Fame. 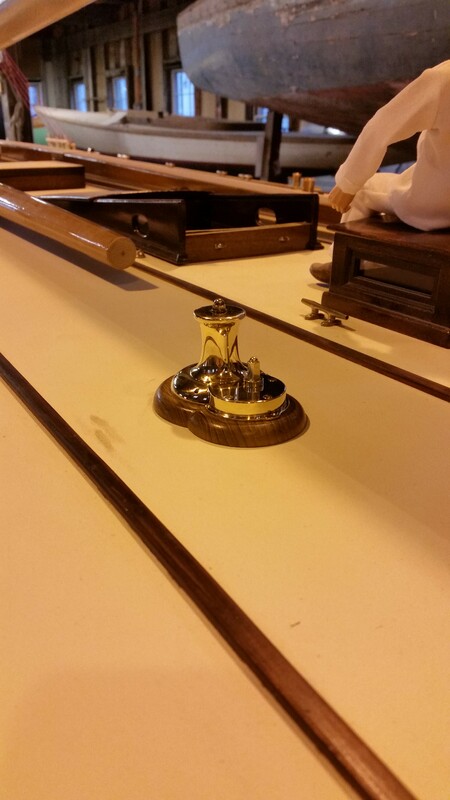 Burr made and delivered teak pads and their accompanying capstans a few days ago. Zach the intern admired them so much that we put him to manual labor; now, we’ve got the three capstans firmly in place! The fourth of the capstans, complete with a crank handle, will be mounted starboard side, on the forward end of the boom. Imagine that: a deck winch attached to a boom! 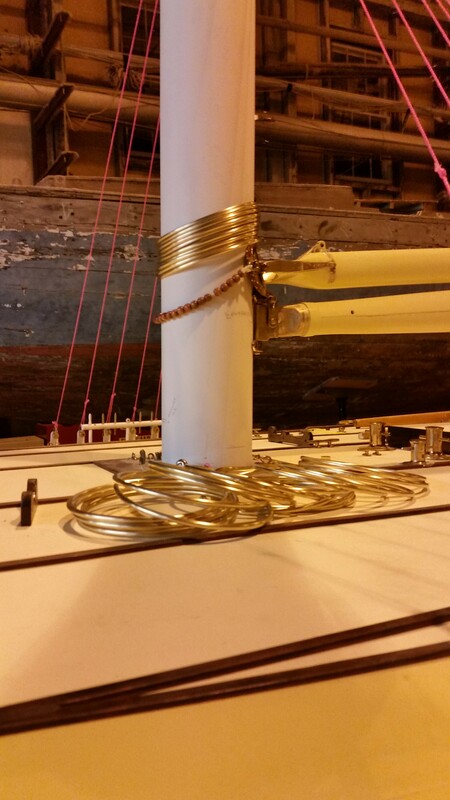 This entry was posted in Project Manager's Welcome and tagged boom, capstan, Herreshoff, Herreshoff Marine Museum, RELIANCE, Reliance Model, RELIANCE Project, winch on December 10, 2014 by Herreshoff Marine Museum/America's Cup Hall of Fame. 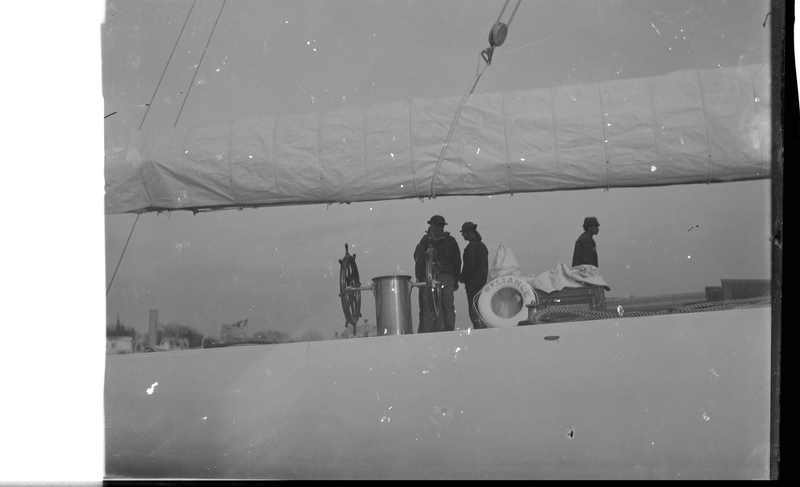 Norene Rickson, Herreshoff Museum’s archivist, stumbled upon some photographs of the RELIANCE that prove very useful when zoomed in. You can see, in good detail, the scuppers, deck capstan with a massive winch handle, and a bight of large manila line. 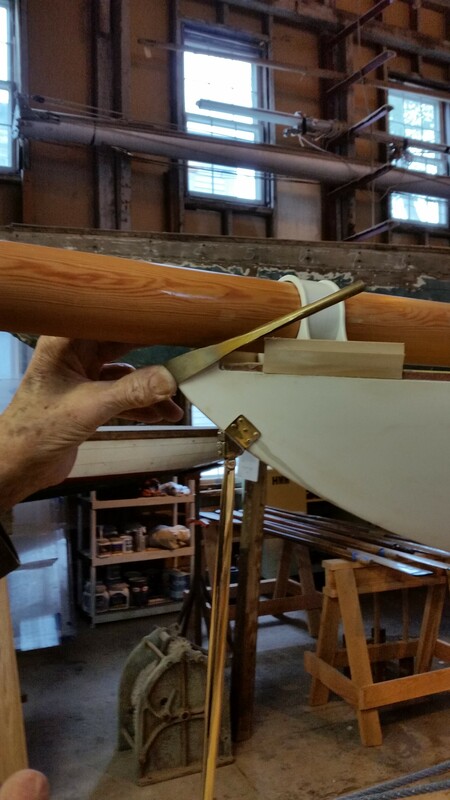 This entry was posted in Project Manager's Welcome and tagged America's Cup, capstan, Herreshoff, Herreshoff Marine Museum, HMCo, RELIANCE, RELIANCE Project, scudders on November 5, 2014 by Herreshoff Marine Museum/America's Cup Hall of Fame.